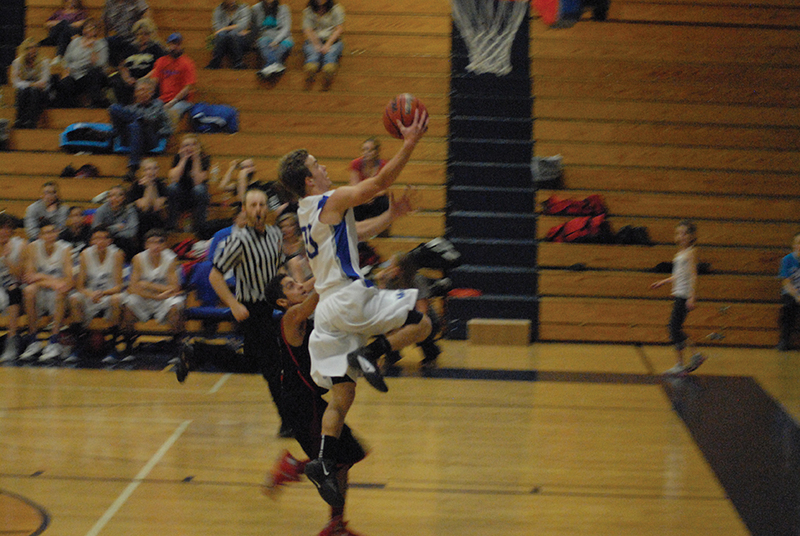 Moffat County High School junior Taft Cleverly goes up for a layup at the tail end of a fast break. Cleverly scored 14 for the Bulldogs, who beat Grand Valley, 84-43, Thursday night in the MCHS gym. As the final horn sounded, the Moffat County boys basketball team dribbled out an impressive win to open its league season. The Bulldogs, after some offensive struggles in Meeker a week ago, delivered a full-game performance and put the rest of the Western Slope League 3A on notice with an 84-43 victory over Grand Valley High School Thursday night. Moffat County (now 4-0) built a lead in the first quarter by creating turnovers with full-court pressure on defense. Head coach Eric Hamilton believes this group of players feeds off early-game energy, so he forced it into the game from the opening tip. The Bulldogs took an 18-7 advantage after the first and never looked back. In the second half especially, their up-and-down style was on full display, as they poured in 28 points in a dominant third quarter. Perhaps even more importantly, the 41-point win came from a wide range of players contributing in all facets of the game. The Bulldogs had four players score in double figures, led by sophomore Tyler Davis’s 18. Hamilton said it was their best team effort of the young season. Every member of the team got into the game and played several minutes, and the Bulldogs turned suffocating pressure defense into easy points on the other end. Coming off a 6-13 season the Moffat County coaches and players were confident they would be a bigger force in the league this season. While Hamilton knows Grand Valley was without a couple players, a victory in this fashion will make the rest of their league know the MCHS is no pushover. Cleverly called it a statement win. “We wanted to start the league off right, get a win and send the statement that we’re here to do well,” he said.